The Covidien Nellcor Bedside Respiratory Patient Monitoring System detects if a patient's oxygen level has dipped to a dangerous level. 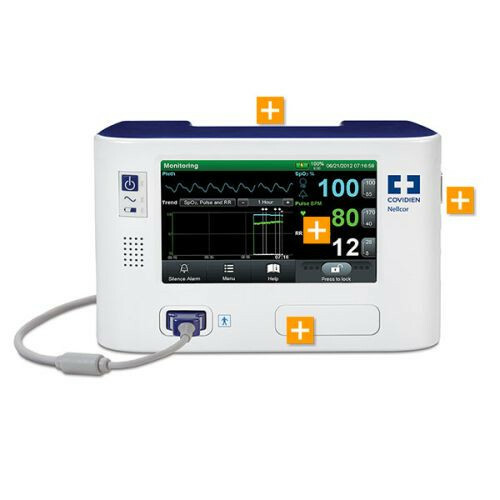 This Pulse Oximeter provides accurate SpO2, pulse rate and respiration rate monitoring with audible and visual alarms to allow for intervention when complications are detected. It also includes the OxiMax pattern alert when there is repetitive reduction in airflow. The Nellcor PM1000N has easy to use color touch screen with graphical interface. The memory stores up to 48 hours of trend data which can be downloaded to a USB drive or personal computer for analysis when physician is making a treatment plan. 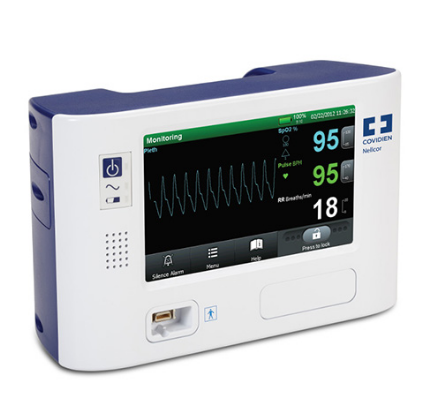 The Bedside Respiratory Patient Monitor is lightweight and portable to make it convenient when traveling. The USB port makes it easy to update for ongoing upgrades with the Nellcor respiration rate software. You may also be interested in a Handheld Pulse Oximeter also manufactured by Covidien.